Made by John Egan, a Dublin pedal harp maker, and later by his nephew Francis Hewson, between 1820 and 1840. Other makers also made similar instruments at this time, copying Egan. These instruments were of large high-headed design. Their soundboxes are built up in the style of pedal harp bodies; the neck and pillar being very plain and of a curious curving shape similar to Egan's “newly invented Portable harp” with gut strings, the predecessor of the modern lever harp. I am not sure how many are extant. Nancy Hurrell has been catalogueing the ones made by Egan, and has listed six extant examples, some in private collections and some in museums. 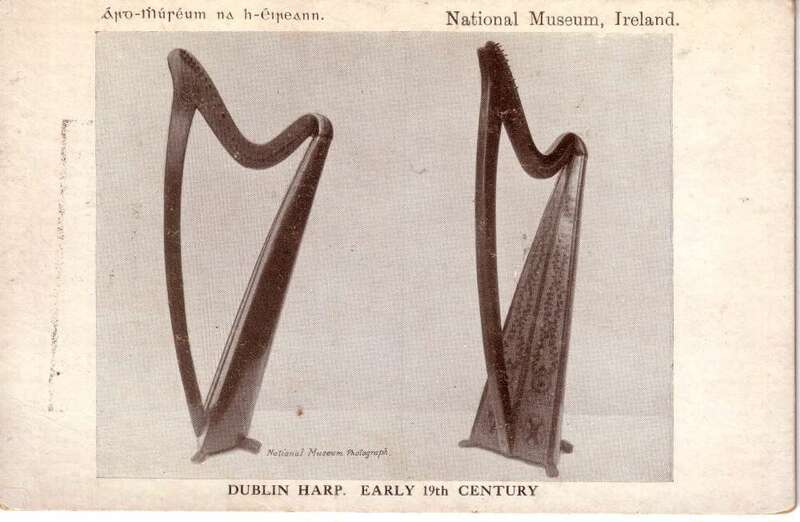 There are also harps made by Egan's nephew, Frances Hewson, and others made by other makers copying Egan's design. Joan Rimmer slated these instruments in her 1969 book as “nightmare parodies of the old Irish harp” and criticises their “peculiarly unattractive” tone. However as her only concrete complaint was that their sound is “excessively long-lasting unless damped” - hardly a fault in an early Irish harp - we should not put too much store by her comments. These large, wire-strung, Gaelic harps made by Egan for the Society are often confused with Egan's smaller 'Royal Portable' harps, which have gut strings and mechanical semitone fretting devices. Both types were often decorated with golden shamrocks, and have a similar curving profile, but whereas the Society instruments were about 6 feet tall with brass wire strings and intended for Gaelic harp students, the Portable harps were about 3 feet tall with gut strings and semitone mechanisms and were intended for upper-class classically trained musicians. First published November 2005, last updated Dec 2018.